Robbi and I are happy to report that next year's tour season is well on track, despite the world's current challenges, to be one of our best years ever. We have some wonderful new experiences to share with our guests in 2009 and once again it is our returning Aroma Travellers and their friends who are the backbone of our continuing success. We have added several new pages of memorable photos from our 2008 adventures for you to enjoy, including more lovely images kindly contributed by our Aroma Travellers. The city enjoyed its most brilliant period in the 2nd and 3rd centuries A.D. and thanks to the presence of a Jewish community, facilitated the early spread of Christianity. It was here that the Apostle Philip was martyred in 80 A.D. and the church dedicated to his memory, was largely responsible for the increased importance of the city during the Byzantine period. It was also proclaimed as the capital of the Phrygian region by Emperor Constantine. For all of us, standing in this ancient place, surrounded by the ruins of the once mighty city with its extensive baths, huge theatre, temples and streetscapes, whilst gazing out over the hundred metre tall network of limestone terraces and magnificent stalactite walls, with their fantastic shapes reminiscent of oyster shells and flower petals to the valley far below, was nothing short of breathtaking. But wait, there's more! Hierapolis also has one of the most extensive and well preserved ancient cemeteries in the world, with more than 1200 tombs, spread out across a distance of two kilometres. The Hierapolis necropolis is renowned for its wide variety of tombs dating from the late Hellenistic period to early Christian times; including tumuli, sarcophagi, and house-shaped mausolea. One of the most iconic images you will find of Provence on postcards and in coffee table books is the Abbey of Senanque with its 12th century facade nestled behind flowering lavandin fields. However, last year, during our visit to the abbey we couldn't help but notice that every single lavandin plant was covered with an infestation of small white snails. Furthermore, these voracious little pests, that for some reason were in plague proportions last year, were happily nibbling off the flowering heads of their host lavandin plant. 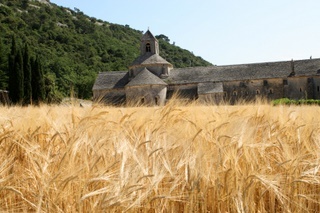 This year when we arrived it was clear that the snails had won the battle and instead of lavandin, the abbey was wreathed in golden wheat. Across the region, lavandin farmers have been struggling with an increasing number of pests and other challenges, including climate change, to the point that some farmers are even wondering if in the future, they will be able to grow lavandin in some of the traditional areas at all. 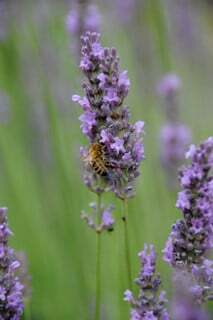 True lavender on the other hand has not suffered from the snail infestation, however, significant global warming could create problems in the longer term for the high altitude, high quality, ester-rich lavender growers. 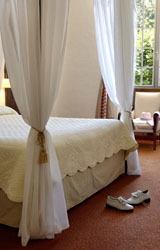 This year we enjoyed the largest number of returning guests we have ever had, making up 27% of our total numbers. For Robbi and myself, it was such a great delight to be welcoming back so many good friends. Robbi and I would also like to give our heart-felt thanks to all of you who continue to support us with your kind words and referrals as you spread news of our tours and retreats amongst your friends. Our thanks also, for your lovely messages of appreciation, it is a great joy for us to received them and we have compiled a Page of Guest Comments from 2008 to remind us the wonderful times we shared together. Robbi and I are pleased to see that thanks to our hard work earlier this year and the enthusiasm of our returning Aroma Travellers, we are well on-track for another successful tour season. Our Aromas of Tuscany, Turkish Aromatic Odyssey and Flavours of Italy tours are once again proving to be very popular and we expect that they will be fully booked shortly. Robbi and I invite you to join us for one of our Aromatic Adventures in 2009 and share our passion for the places and experiences we have created for you to enjoy. +61 3 5331 3254 (afternoon/evening USA time zones, mornings from other countries). From the USA the international dialling prefix which replaces the '+' in our phone number is 011 from most other countries it is 00. During our travels we are always keeping an eye out for new locations and experiences to add to our offerings. As a result we are excited to announce that from next year we will be staying for the last three nights of our popular Essential Provence Tour in a delightful newly refurbished, boutique hotel in the Cote d'Azur hinterland. Our hotel, once an olive grove and farm, is a luxurious experience and additionally, we have made a few changes to the tour itinerary, which take advantage of the exquisite villages and nearby restaurants that we will enjoy sharing with you. I have been asked from time to time by some of our guests, if we can arrange a round of golf during our tours. Happily, one of the fringe benefits of our new hotel's location is that this is now possible. As well as panoramic views, beautiful villages and delicious wines, Provence is also renowned for its flavoursome fruit and vegetables. Each year we love to experience the progression of seasonal produce, growing in the countryside and arriving perfectly ripe and bursting with freshness in the local market stalls. Cooking with fresh, seasonal produce is the way of life here and the village markets which are found all over Provence are always bustling with locals inspecting melons, sniffing cheeses, tasting sausages and gathering the fresh makings of their next few meals. This focus on freshness is also an irreplaceable element in the wonderful meals that we enjoy during our tours. Such delights as zucchini flowers, asparagus, aubergine, vine ripened tomatoes, artichokes, garlic et. al. which are expertly incorporated into the delicious 2 hour lunches that we all love to enjoy. During our Flavours of Provence Tour this year we were invited by our friend Yves to visit one of his cherry orchards to experience harvesting first hand. Of course, we also had in mind all of those beautiful ripe cherries just waiting to be sampled! Travelling down tiny lanes and through paddocks was great fun until around the next corner we arrived amongst thousands of cherry trees. After searching the rows, we felt the ground tremble as we approached the cherry pickers in full flight. What we found wasn't an army of men beating branches but an amazing looking 3 wheeled machine, skipping nimbly from tree to tree, grasping them by their trunks, unfolding a telescopic inverted umbrella and then shaking each tree vigorously. The cherries cascaded down into the umbrella and were then channelled up a conveyor belt into large bins that have been half filled with water. The cherries float in the water which protects them from being crushed and after harvesting several trees, the full bin is carried away and another takes its place in procession behind the harvester; and so it goes for 14 hours a day for 2 weeks. The cherries by the way tasted incredible! After years of continuing downturn, last year we finally saw a significant increase in the number of fields placed back under clary sage cultivation. It was so nice to finally see the beautiful pink pastel colour of clary sage fields coming back into the landscape of the Haute Provence. This year however, as we visited those same fields prior to our first Provence tour, it seemed that the comeback had stalled. Once again we found that clary sage was struggling and in poor condition, but in this particular case it was due to the affects of an unusually long wet winter. Happily with the arrival of warmer days, the clary sage was able to make up for lost sunshine time and by the time we returned the countryside had regained its vibrant aromatic pinkish hue. Unlike normal vinegar which is made from fermented grapes, balsamic vinegar is produced by boiling down the juice of freshly pressed white Trebbiano grapes to form a dark syrup. The syrup is then inoculated with a "mother" culture of acid forming bacteria which are responsible for the transformation of the sweet syrup into vinegar. The heating also kills any yeast present. Next comes the very lengthy and carefully controlled process of aging, which involves placing the inoculated syrup into a series of smaller and smaller oak barrels [chestnut, cherry, ash, mulberry, and juniper woods may also be used], that are left open to the air. The barrels are traditionally kept in the warm attics of barns which facilitate evaporation of moisture and concentration of flavour. The next quality of balsamic vinegar is achieved after 25 years and yields the astonishingly textured and deeply flavourful, Aceto Balsamico Tradizionale Extravecchio. This balsamico is so fine that it can be sipped just like a digestive and has a sweet, velvety richness that fills your mouth with delight. Our delicious homemade lunch of risotto, flavoured with 6 year old balsamico along with a 25 year old balsamico as condiment was absolutely divine. Maybe it's hard to imagine how vinegar and rice should be used for anything other than sushi but the subtlety and richness of flavour and clearly different character of the two vinegars was just magical. There are many products calling themselves balsamic vinegar in our stores that are little more than cheap vinegar that has been caramelized and put into an interesting bottle. This is perfectly fine but if you would like to try the genuine Aceto Balsamico Tradizionale, remember to look for the globe shaped bottle. In our September newsletter we proudly announced that our new Provence Lavender Tour was a great success and has gained the accolade of being featured in Frommer's directory. And now, we are thrilled to add the exciting news that next year, the world's premier bicycle race, the Tour de France will be passing right through our beautiful village amongst the lavender fields during our stay! So for the Aroma Travellers joining us next year amongst the fragrant purple fields, our Provence Lavender Tour is going to be an even more exceptional feast for the senses. Since we began our Aroma Tours adventures many years ago, it has been our great pleasure to share our passion for the aromatic plants of Provence with one of France's finest distillers of essential oils. Rene began his life amongst aromatic plants, as a young boy harvesting wild lavender by hand in the forest above his home. This amazing man of the soil has always lived within a kilometre of his birth and was the first farmer in the region to start growing aromatic plants organically. When we first arrived at his farm, many years ago now, I can clearly remember his face beaming with pride as he leant on his stoking shovel, dressed in his obligatory blue overalls, as we all made delighted ooh's and ahh's in response to the glorious scent of his latest aromatic charge. Over the years, Rene and his wife have become our close friends and although he is now retired, we are happy to report that his aromatic dynasty will continue through his son Guillame. Next year we look forward to returning to the farm that Rene built during our Provence Aromatherapy Retreat and sharing his legacy with our Aroma Travellers. I love this delicious, rustic French dish which is absolutely ideal for warming the soul on chilly winter evenings. This particular recipe comes from a sumptuous new and innovative cookbook by our good friend and restaurateur Adrian Richardson, simply titled "Meat". We were invited to the book launch last week in Melbourne which was a delicious celebration of Adrian's culinary skills and dedication to fine food. Dining at La Luna is a gastronomique experience! 1kg lean braising beef (chuck, blade or rump), cut into 2cm cubes. 100g thick-cut rashers smoky bacon, cut into 2cm cubes. If time allows, marinade the beef overnight in the red wine and then remove from the marinade and continue with the dish. Heat the olive oil in a heavy-based metal casserole over medium heat and when the oil is sizzling, brown the beef in batches, so the heat remains high. Transfer the browned beef to a plate. Add the bacon to the casserole and fry until golden brown. Transfer to the plate with the beef. Add the butter to the casserole and when it sizzles, add the shallots. Cook over a medium heat until the shallots soften and begin to colour a lovely golden brown. Lower the heat and add the diced onion and carrot. Saute for 5 minutes until they start to soften. Add the mushrooms and saute for 4 minutes, stirring from time to time. Stir in the paprika and add the wine and stock. Return the beef and bacon to the casserole and bring to the boil, then gently simmer uncovered for 1.5 hours or until meat is tender. Top up with stock if necessary. To thicken the sauce, stir in the cornflour paste and simmer for a further 5 minutes. Serve with sour cream and fresh herbs and plenty of buttered new potatoes. It is a simple dish but when made properly, it is absolutely delightful. The perfect wine would be a nice cabernet sauvignon or gamay. Enjoy! There is of course good reason to have this filtering, however, as a consequence we recommend that you add our email address info@aroma-tours.com to your address book or white list to help ensure that our newsletter will continue to be delivered to you successfully. "Passion is the mother of all the efforts. Without it, nothing great is ever achieved."